How do I save on gas in a truck? Should I repair my truck or buy a new one? Is my truck safe to drive? Unless your vehicle requires premium gasoline or diesel, filling up your truck or semi with high-octane gas is a waste of money. The premium gas doesn't boost your gas mileage or performance. If you're not sure what grade works best for your vehicle, your owner's manual will tell you. You can also ask your mechanic what grade to use. Using regular gasoline over high-octane gasoline could save you hundreds of dollars a year. Don't top off when filling your truck's gas tank. Any additional gas is just going to slop around or seep out. Stop pumping at the first indication that your tank is full when the automatic nozzle clicks off. Gas will evaporate from the gas tank if it has an escape. Loose, missing or damaged gas caps cause 147 million gallons of gas to evaporate each year, according to the Car Care Council. So be sure to tighten up that gas cap each time you fuel up your truck or semi. The hot summer sun that makes the inside of your truck feel like a sauna which also zaps fuel from your gas tank. So park your truck or semi in the shade of a building or tree whenever possible. And buy a good windshield shade. A windshield shade blocks sunlight and helps to keep heat out of the inside of your truck. Got a garage? Clear it out and make room for your truck. Parking in your garage will help your truck stay warm in winter and cool in summer, and you won't have to depend as much on your gas-guzzling air-conditioning or defroster when you drive. Don't get caught driving on under inflated tires. Under inflated tires wear down more quickly, and they also lower your truck's gas mileage. Your truck's gas mileage may plummet by as much as 15 percent. Driving on under inflated tires may also reduce the life of your tires by 15 percent or more. Buy a digital gauge and keep it in your glove box. Compare the pressure in your tires with the recommended pressure listed in your owner's manual and on the placard located in your truck door. Then inflate your tires as needed. Be sure to check tire pressure when your tires are cold. A good time is early in the morning after your truck's been idle overnight. Fixing a truck that is out of tune or has failed an emissions test can boost gas mileage by about 4 percent. So be sure to give your vehicle regular tune-ups. You'll also want to watch out for worn spark plugs. A misfiring spark plug can reduce a truck's fuel efficiency by as much as 30 percent. Ensure your mechanic checks for them. When the engine air filter clogs with dirt, dust and bugs, it causes your engine to work harder and your truck becomes less fuel efficient. Replacing a clogged air filter could improve your gas mileage by as much as 10 percent and save you 15 cents a gallon. It's a good idea to have your engine air filter checked at each oil change. Your truck's performance depends on it being properly maintained. The owner's manual of your vehicle will tell you what maintenance is needed and when. 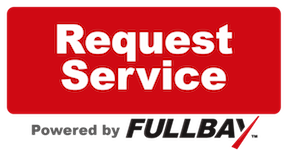 If you have any questions, your truck repair shop will be able to show you the recommended maintenance for your truck or semi. Follow the truck care guidelines outlined in your owner's manual. Not only will they improve efficiency, they will also save you money on costly repairs in the long run. If the pressure is too low, it can cause a blowout at high speed. Also have them check the tread on the tires for excessive wear. (You can also do this yourself by placing the head of a penny into the tread of the tire. If you can see all of Lincoln's head, you probably need new tires.) Be sure to have your truck or diesel repair shop check to see that the spare tire is inflated and the appropriate tools are available to install it if necessary. Are you going somewhere with a warmer or colder climate? Let your repair shop know so your mechanic can adjust the mixture of water and antifreeze to ensure the truck is protected against temperature extremes. The day before you leave, thoroughly wash and vacuum the truck. It's much nicer to have your trip in a clean vehicle. Something goes wrong with your truck and you're faced with a high repair bill. It would be nice to get a new truck, but is that the smartest decision? Would you be better off fixing your current ride, or is it really time to buy a new one? The answers to these questions will vary, so let me give you some information that might help you make a more informed decision. It is almost always less expensive to repair a truck than buy a new one. Insurance and registration fees will go up with a new vehicle. You have a sentimental attachment to your truck. Maybe it was your first vehicle, a gift from a loved one, or a dream truck you finally were able to purchase. For you, buying a new vehicle means giving up an old friend. You're tired of your old truck. Perhaps it embarrasses you, it rattles like crazy or you have to bang on the A/C to get it working. Every morning when you walk outside and see the neighbor's vehicle or truck, you long for something new. That's perfectly normal. Just take a good look at your budget and make an honest assessment of your financial situation. You want something safer. Your truck is old enough where it's simply not safe to drive. When is it time to buy another truck? Regular oil changes as part of preventative maintenance are cheap insurance against engine wear, and will always save you money in the long run if you keep a truck for more than three or four years. To reduce the costs of vehicle ownership and maintenance, many truck makers say the oil filter only needs to be replaced at every other oil change. Most mechanics will tell you this is false economy. For a semi-truck, it would vary depending on how the truck is driven and what brand of oil you use. An oil analysis would be your best bet. They cost a lot less then an oil change and will let you know how your oil is holding up at this time. If you have 10k since your last oil change and it tests well, then, re-sample in another 10k. If you find that at 20k is where it is starting to taper off then you'll know that 20k is your sweet spot. Truck technicians are often compared to doctors. This comparison undoubtedly makes some techs smile and others grimace. But in the end, the two professions have a lot in common. It may surprise consumers to find that by choosing these professionals wisely, they can get better care at a better price. Will the service advisor or tech take time to listen to your description of the truck's problem? If necessary, will they test-drive the vehicle with you? When choosing a professional, the variety that looks after your truck or the variety that looks after your body, ask them the four-questions. In effect, audition them. See how the doctor takes care of your flu and how the tech deals with an oil change before visiting with something more serious. The bottom line is this, time is money. The less time these people are willing to spend with you often multiplies the amount of time needed on the back end. In the case of both the doctor and tech, the extra time spent having to fix you or your truck a second or third time not only is expensive, it can be detrimental to the truck or patient's condition. When using your heating system, there are some tips to help keep you warm and your windows clear. When using your defroster, make sure you are using the fresh air from the outside of the truck. Have you ever seen someone driving down the road and all the windows are fogged up? The reason is the truck is using the inside air in the truck and the system can't get rid of the moisture in the air. And that's why the windows fog up. Also, using the air conditioning in this mode helps too since one of the things the A/C system does is remove the moisture from the air and with the heat on you will keep the inside of the truck warm. In fact some of the newer trucks automatically turn on the A/C and use fresh air in defrost mode. If you don't know about your vehicle, look in your owner's manual, or just drop by and we will be glad to show you how it works. Your wipers are also key to keeping your windows clean. Making sure you have the proper washer fluid that is ready for the cold weather will also help you do this. Having a snow brush in the truck with an ice scraper will keep you prepared for whatever happens. Keeping your tires inflated properly and make sure you have good tread will help you with traction and control. A lot of the newer trucks have great things like anti-lock brakes and traction control which help with the bad weather. But these systems work much better when you have the most grip you can with good tires.